You are currently browsing the tag archive for the ‘Franny and Zooey’ tag. I didn’t like hearing him say that. It made me sound dead or something. It was very depressing. “I guess I will,” I said. Hello folks. I am still in Ireland, not long before my return flight to Oz. You may recall I attempted yet another unwise challenge during my flight here during which I read three books on the plane. Not the most conducive of reading experiences it must be said. Which is why I have taken so long to write this review. Were my impressions on returning to this book, which I enjoyed so much as a teenager, affected by the long-distance flight? Or is it the case that I now view the book with new eyes, as a consequence of how I have changed since I first read it? Holden Caufield’s adventures begin with yet another expulsion from a well-known boarding school in Pennsylvania. Rather then suffer further embarrassment he travels to New York, deciding to enjoy a short break before returning home to his family. He gets drunk, tries to look up old girlfriends and behaves in a manner befitting a wealthy twenty-something New York socialite as opposed to a fifteen year old who refuses to grow up. Yes he cherry-picks the behaviours of adult hood that he enjoys, but most of all he clings to a sense of innocence that he feels the world is robbing him of and indeed everyone else. Part of this stems from the death of his brother Allie, whom Holden regards as superior to him in almost every way. Partly he is also concerned for what will happen to his younger sister, Phoebe, who worships him. Most others, including his talented older brother D.B. who departed for Hollywood to work as a writer, he regards as phonys. I’m quite illiterate, but I read a lot. Holden is frequently criticised by fellow students and teachers for his seeming immaturity. He deliberately speaks in an exaggerated teenage manner and oftentimes Salinger presents him as thinking in this way too. But his spoken words and thoughts belie the thoughtfulness of Holden, desperately trying to understand a world he does not believe himself fit to live in. Yes the world is full of phonys, but they seem to know what to do with their lives. Why did he survive into adolescence and Allie not? I used to think she was quite intelligent, in my stupidity. The reason I did was because she knew quite a lot about the theater and plays and literature and all that stuff. If somebody knows quite a lot about those things, it takes you quite a while to find out whether they’re really stupid or not. Crap, he’s on to me! 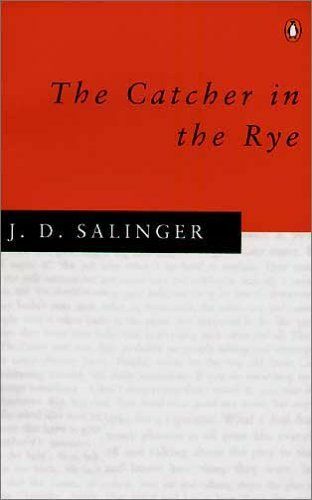 I opened this review with a certain tired reluctance and unfortunately for all the great craft and sincerity on show here – Salinger is too clever to allow his archetypal rebel to succeed – I have fallen out of love with Holden. I think this is mainly because the trickle down effect of this novel’s incredible success has quite diluted its impact. There are hundreds of Holdens out there. In fact watch an episode of Gossip Girl some time. Go on, I dare you. Notice how clever they all seem to think they are? Maybe a hipster reference every ten minutes or so? Yeah. That’s what they did to Holden, turned him into a neo-dandy. Whereas I saw him as Peter Pan who failed to find NeverLand. Stuck in the grimness of New York, unable to rescue all the lost boys and girls. A few years ago I read Franny and Zooey which I enjoyed immensely. I notice that has not attracted the slavish worship of The Cather in the Rye. For the best I feel. An undoubted classic, but weakened by the repetition of the decades since.